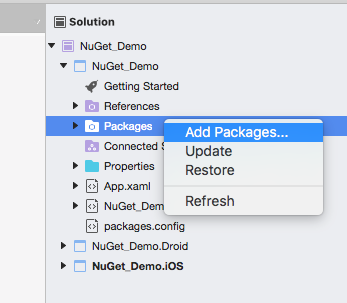 You can use the Syncfusion NuGet packages without installing the Essential Studio or platform installation to implement the Syncfusion controls.The Syncfusion Xamarin NuGet packages are published in public NuGet.org from v15.4.0.17. So, no need any additional configurations required to utilize the Syncfusion Xamarin NuGet packages from v15.4.0.17. By default, the NuGet.org package is selected in the Package source drop-down. If NuGet.org is not configured in your Visual Studio, refer to the Microsoft docs to configure NuGet.org feed URL in your Visual Studio. 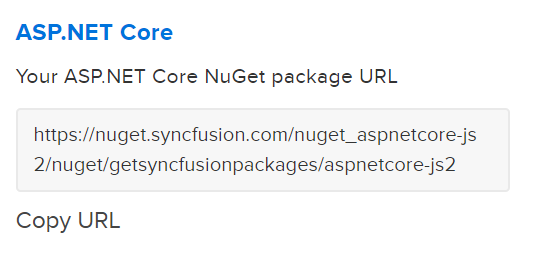 The Syncfusion NuGet Packages are listed the available package in the source feed URL. Search and install the required packages in your application, by clicking Install button. 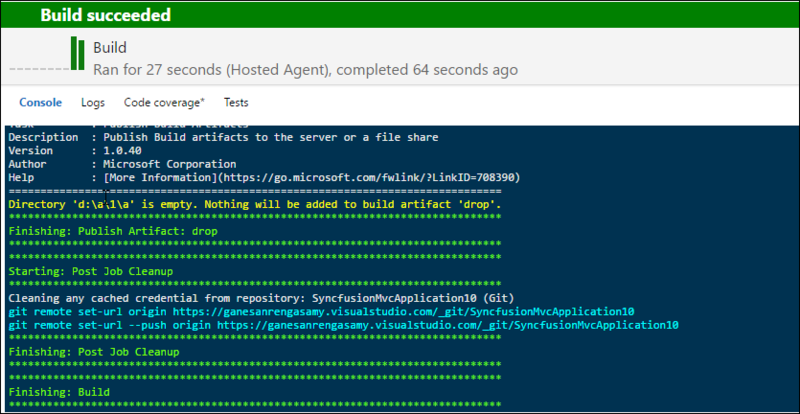 The Syncfusion NuGet packages are published in public NuGet.org from v16.2.0.46. So, If you need to Install earlier version of 16.2.0.46 Syncfusion NuGet packages, configure Syncfusion private feed URL. 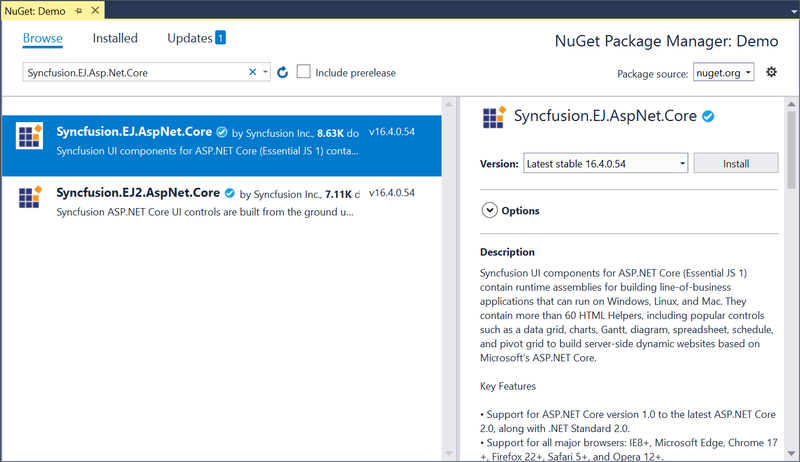 To reference the Syncfusion component using the Package Manager Console as NuGet packages, follow the below steps. Run the following NuGet installation commands. By default, the NuGet.org package is selected in the Package source drop-down. 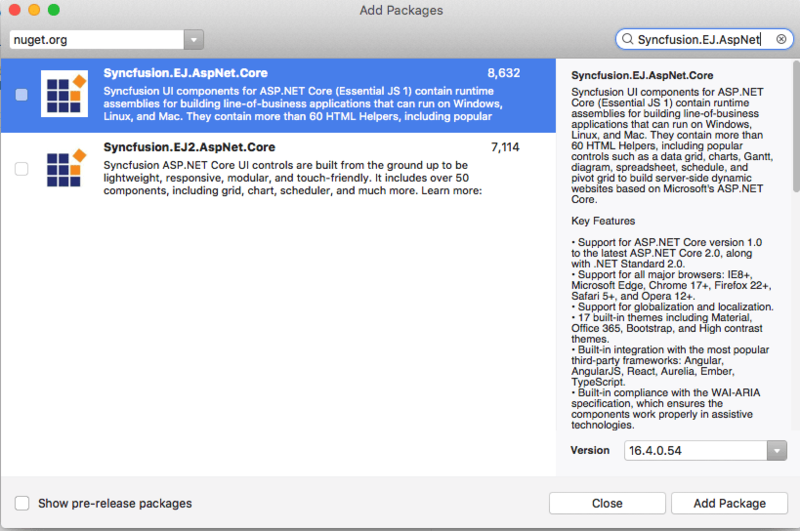 The Syncfusion NuGet Packages available in the package source location will be listed. 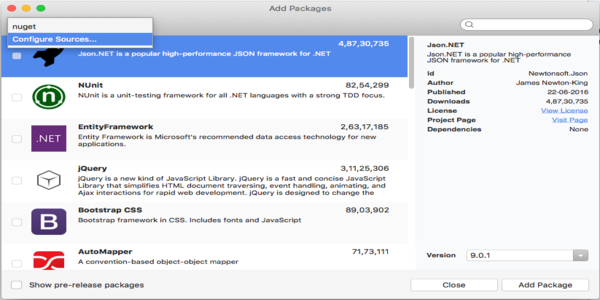 Search and install the required packages in your application, by clicking Add Package button. To update the existing nuget.exe to latest version use the following command. Open the downloaded executable location in the command window, and run the following commands to download and install the required NuGet packages to a project specified in the package.config. If you need to Install earlier version of 16.2.0.46 Syncfusion NuGet packages, configure Syncfusion private feed URL. The NuGet Command Line Interface (CLI), Dotnet.exe, provides the full extent of NuGet functionality to add, restore, pack, publish, and manage packages without making any change to the project files. Open command prompt window with administrator privileges and navigate to your project folder. To know more command about the dotnet CLI, refer here. 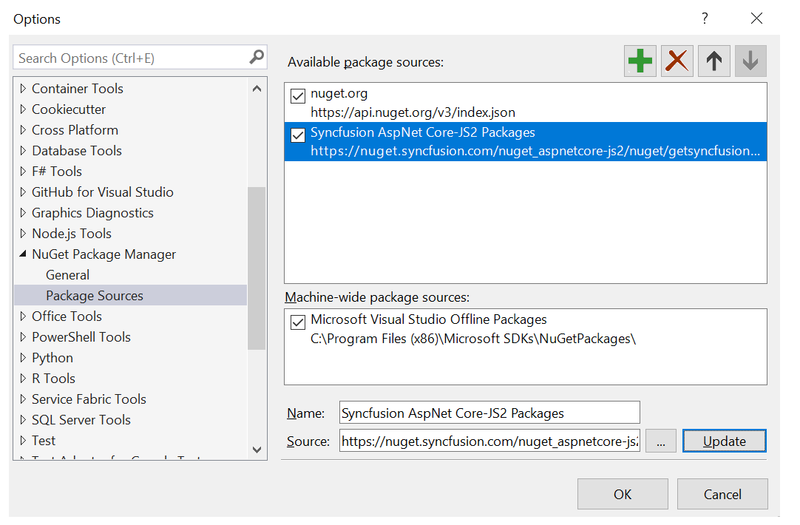 The following steps help you to configure and restore the Syncfusion NuGet packages in Visual Studio online application. 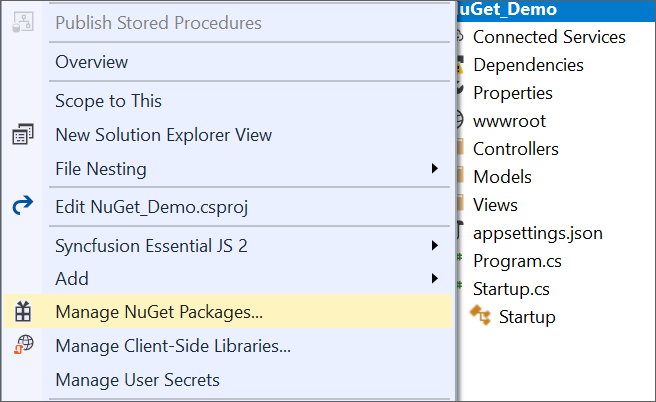 Create and add the NuGet.config file in your Visual Studio online application location. By default, the NuGet.org feed link can be added in the NuGet.config file. 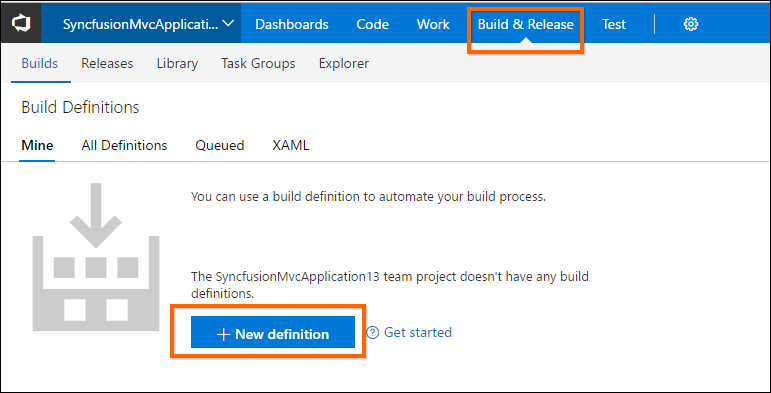 If your application doesn’t have any build definitions, create a new build definition by clicking the New Definition button under Build & Release. 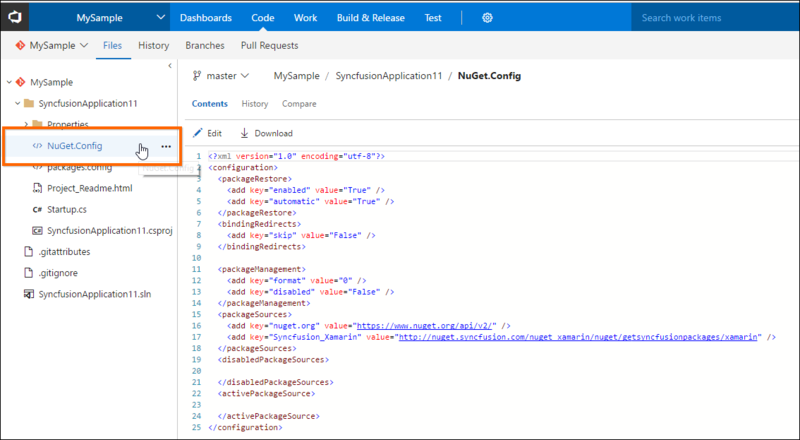 If your application has any build definitions, navigate to Build & Release tab and select the Edit option from corresponding application to include the NuGet restore process. If you cannot find the NuGet restore process from these build definitions, add it by using Add build step -> Package -> NuGet Installer. Update path of the NuGet.config file in Path to NuGet.config textbox and Save this as build definition. Then, start the build process by clicking the Queue new build button. The required NuGet packages are restored and the project will be compiled successfully. 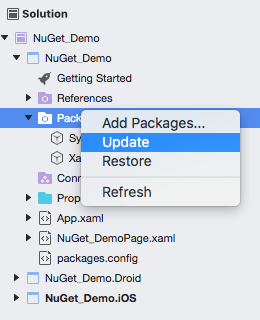 NuGet packages can be updated to their specific version or latest version available in the Visual Studio solution or project. Right-click the Packages folder in the project, and select Update. This will update the NuGet package to the latest version. You can double-click the Add packages and choose the specific version. To update the installed Syncfusion NuGet packages using the Package Manager Console, follow the below steps. Using the NuGet CLI, all the NuGet packages in the project can be updated to the available latest version. Open the downloaded executable location in the command window. Run the following “update commands” to update the Syncfusion ASP.NET Core NuGet packages. Navigate to nuget.syncfusion.com, and select the required platform tab. Click the Copy URL label under required platform to copy the Syncfusion required platform NuGet feed to clipboard. 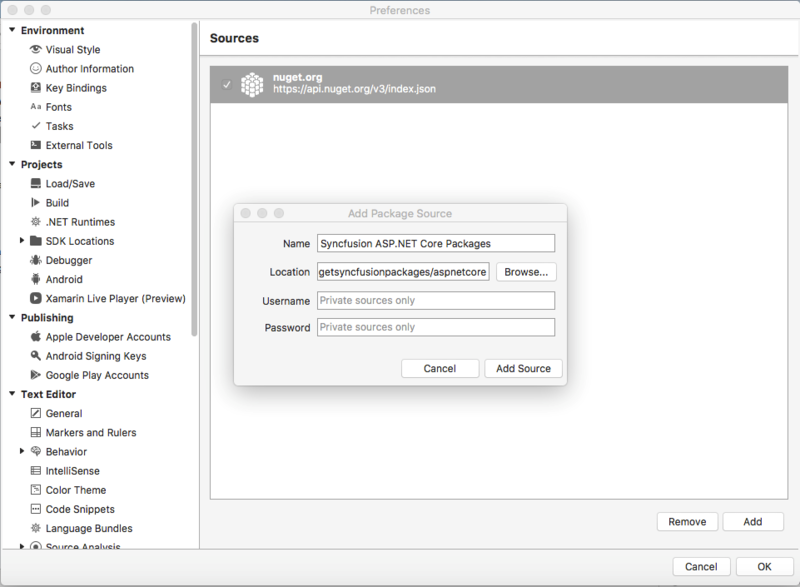 Click the Add button (green plus), and enter the ‘Package Name’ and ‘Package Source URL’ of the Syncfusion NuGet packages. Name: Name of the package source. Source: Syncfusion NuGet Feed URL. For example, Name: Syncfusion AspNet Core Packages, Source: http://nuget.syncfusion.com/nuget_aspnetcore/nuget/getsyncfusionpackages/aspnetcore. For example, Name: Syncfusion ASP.NET Core Packages, Source: http://nuget.syncfusion.com/nuget_aspnetcore/nuget/getsyncfusionpackages/aspnetcore.